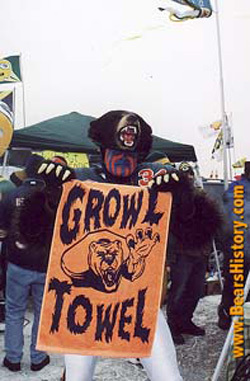 During the 1998 season, Visa introduced the "Visa Hall of Fans" contest, which encourages NFL fans to write an essay describing why that individual feels they are best representative of their team. I was fortunate to win the award during the 2000 season, and am acquainted with two of the other winners, from 1998 and 2002. Here are their photos and stories. The contest is now defunct. If you've seen a Bears home game, you've seen Don. Of course, he's the crazy looking guy in the stuffed Bear head that runs around with the flag after scores at Bears home games. I've also spotted him on TV at away games because when the camera crew sees him in the stands, they usually can't resist. As the initial winner of the Hall of Fans contest, Don actually won a trip to Canton, OH to meet the rest of the initial class of winners. Don is very active in the group of Visa fans; their website can be found at FootballsFans.com. Don and I have attended the Bears game in Green Bay the past two years, and he's also made trips to Detroit, Cincinnati and Carolina in full garb. That's me; I won the award in 2000. I had applied at the urging of Don in 1999, but that year the award was presented to the other guy that runs around as a cheerleader at Bear games. I had no expectations of winning the award, as most recognition such as this is reserved for the face-painting, flamboyant-dressing fans of the NFL, which I most certainly am not. My "schtick" isn't that I dress up and act as a cheerleader, but that I can name for you just about anything that has transpired about the Bears over the last 24 years. I was too busy to apply for the award in 2000, but the organizers of the contest called me to ask me to re-apply as they remembered my essay from the previous year. I'll always say that I'm proud to have won the award during a year in which the Bears were 5-11, as my loyalty to the team doesn't waver based on their record. Steve and I are members of TKE fraternity at Illinois State, and started & finished school together, so we go way back. I didn't even know that he applied for the award this year, and ironically, our fraternity chapter now boasts two members of the Pro Football Hall of Fame... I can honestly say that Steve's Bear-mania rivals my own. He keeps a copy of the Mike Ditka show from the mid-80's during which he stands up to ask the coach a question as a 14-year-old. Perhaps his best story to tell from his essay was that he actually stops at Payton's Hill in Arlington Heights and ascends it before every Bears game. 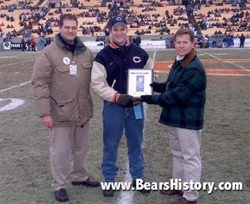 It seems that the Bears organization treated Steve well before he received his plaque at the December 17th Jets game. He received passes for he and his family to attend the VIP tailgate tent and they were all allowed on the field with him. 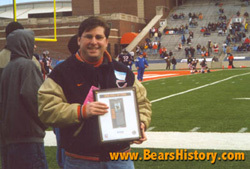 If another Bears Hall of Fame fan stops by this page, by all means let me know and I'd be happy to add your profile.